This is the fifth and final part of my response to a recent article by G.azelem. Curiously, it is in that same revelation that Sidney Rigdon is assigned to consecrate and dedicate the land of Zion for the temple. Why was Sidney given this role and not Joseph? Does it matter who consecrates the land of Zion and dedicates it for the temple? I don’t believe that it does. Rather it matters that this was done by the proper priesthood authority. Because this is to be accomplished in the third watch, and it is in the third watch that Sidney will act as Christ/Elias as one who has been identified as an arm of the Lord. Orson Hyde dedicated Palestine for the return of the Jews, does this mean he will lead the gathering himself as Christ/Elias? I don’t think so. Same goes for this idea with Sidney Rigdon. Yes, Christ will return from the heavens to reign as King of Kings and Lord of Lords upon the earth. Prior to the millennium, He will separate the sheep from the goats. He will destroy the wicked from off the face of the earth, cleanse it, and so on. There’s no indication that His return will be another condescension however. He will return in glory in the clouds of heaven. With that said, will Jesus Christ literally come down to the earth and subdue the enemies? If the scriptures are true, then yes He will literally come down and do this. There are many scriptures which show this to be the case. I will share just one, D&C 133:46-51. Is not that the duty of the weak things of the earth? What if Christ condescends by virtue of the servants he has deemed as his two arms? This verse does not suggest that Christ is infusing Himself within a mortal to perform the functions of the priesthood. Christ does not indwell in mortals. First of all, Christ is a resurrected being with a body of flesh and bones and not a spirit (Luke 24:39). The Book of Mormon teaches us that after the resurrection the spirit and body are never to be separated again. Furthermore if Christ can indwell Himself inside anyone He chooses, then what is the purpose of the Holy Ghost? Is it not the Holy Ghost who can dwell inside of us and not Christ? Joseph clarified the nature and roles of the members of the Godhead. His clarification was later canonized in D&C 130. To suggest that Christ acted out sins in order to understand what it is like to commit iniquity is blasphemy. Christ is the one sinless Man to walk upon the earth. He is the lamb without blemish. He cannot sin and does not need to experience what it is like to commit sin. He suffered for every sin. He felt every pain. He felt every temptation. He took our sins upon Himself, when He was slain for the sins of the world in the meridian of time. To suggest that that He still needed to experience what it was like to commit iniquity 1800 years later, is to suggest that the atonement was not fully complete when Christ was slain. This is again blasphemy. Now I’m not suggesting that G.azelem is trying to mock God by stating this. I know he got this false doctrine from Watcher, who I also believe is not trying to intentionally mock God. This is perfect example of the trap one can fall into once one takes a wrong turn and doesn’t course correct. G.azelem does not provide a single scripture to show that Christ still needed to experience what it was like to commit iniquity following His infinite and eternal atonement. He doesn’t provide any scriptures because there aren’t any. This idea flies in the face of the word of God in the scriptures. Even though I have already shown that Christ does not indwell in people and therefore was not slain again inside of Joseph Smith, we see that Revelation 11:8 doesn’t support G.azelem’s conclusions either. Joseph Smith was slain in Carthage, Illinois, which has never been a great city. It is a town of little consequence. The only thing it is known for are Joseph and Hyrum’s deaths. Now perhaps if Revelation 11:8 stated that these prophets would lie in the streets of the “great land which is spiritually called Sodom and Egypt where also our Lord was slain”, G.azelem might have a leg to stand on, but when it says the “great city… where also our Lord was crucified” then it is clear that Jerusalem in the old world is being referred to. These words of the Lord are given as a comfort to Joseph Smith in his afflictions. The Lord promises to always be with him no matter what men or the devil do to him. There is absolutely zero indication that Joseph would be cast into hell. G.azelem’s conformation bias continues to get the better of him. The “deep” in D&C 122:7 refers to the possibility of Joseph being killed by his enemies casting him into the sea, not that Joseph was going to be cast into hell. The angel in Revelation 7 is ascending from the east and not from hell. This angel is also identified as Elias who will restore all things in D&C 77:9. This is not Joseph as Joseph and Elias who will restore all things are listed as separate and distinct individuals in D&C 27. D&C 49:6 is speaking of Jesus Christ and says nothing about Sidney Rigdon. This idea of Christ condescending in the person of Sidney Ridgon is unscriptural. This is more unfounded and unsupportable speculation. Isaiah 18:3 speaks of an ensign being lifted on the mountains, which is a clear reference to Sidney. No, actually this is not a clear reference to Sidney. In D&C 124 Sidney was given several conditional promises, contingent upon him remaining with the saints in Nauvoo. Sidney did not do this. The Lord had also said something similar about Martin Harris raising his voice upon the mountains in D&C 19. 29 And thou (Martin) shalt declare glad tidings, yea, publish it upon the mountains, and upon every high place, and among every people that thou shalt be permitted to see. This whole idea just doesn’t make any sense at all. One can’t just cherry pick scriptures and force them to mean what one wants them to. This is all speculation and ultimately a false conclusion. We do not know that Sidney raises the ensign and therefore we do not know that he is the Root of Jesse. Sidney failed to live up to his calling in the end. This is because of their true identities as individuals who have lived through a previous mortal probation. Joseph did not receive the keys of the kingdom individually until he received them in 1836. Before that point he held them jointly with Frederick G. Williams by virtue of Sidney Rigdon within the Presidency of the High Priesthood. Here we go again with the “previous mortal probation” false doctrine. The scriptures do not anywhere state that Sidney Rigdon already held the keys of the gathering of Israel prior to joining the church, or that he held any keys prior to joining the church for that matter. G.azelem is pulling this out of thin air. The keys to the gathering of Israel were given in the Kirtland temple in 1836 (D&C 110) and not before. Those keys were given to Joseph and Oliver and not Sidney. Actually D&C 110 says that Moses, Elias, and Elijah visited Joseph and Oliver and bestowed keys upon them. John the Baptist is not mentioned and Elias and Elijah are shown to be separate individuals. G.azelem is correct that the dispensation of the gospel of Abraham is not a downgrade. He clearly doesn’t understand what the dispensation of the gospel of Abraham really means, but by acknowledging that it is not a downgrade he is one step ahead of the other third watch bloggers in this regard. John the Baptist is Elijah who is to turn the hearts of the children to the fathers, so of course it is John the Baptist who commits the dispensation of the gospel of Abraham! John the Baptist is not Elijah. The Elias referred to in D&C 110 is Elias who will restore all things, who is identified as a separate individual as John the Baptist in JST Matthew 17:14. But the purpose of it is to bear that ministry and priesthood unto all nations which can only be done through the keys of gathering Israel. Remember that Section 110 carefully explains that the keys of gathering Israel were given specifically to Joseph and Oliver and the dispensation of the gospel of Abraham is only stated to have relevance to them respectively. G.azelem is correct that the seed of Abraham is to bear the ministry and priesthood to all nations. This has reference to members of the house of Israel spreading the gospel and priesthood throughout the earth. The tribe of Ephraim specifically has been given this commission, which has been underway since the 1830s. Actually Sidney Rigdon was ordained an elder by the laying on of hands of other Elders in the church, so G.azelem’s entire theory of him previously having the keys to the gathering of Israel falls apart. Then of course there’s the little detail that the Lord never states that Sidney previously held the keys to the gathering of Israel, or that he ever personally held them at any point for that matter. So how did Sidney have the keys of the kingdom? Answer: Sidney held the keys by virtue of being one of Joseph’s councilors in the first presidency, who collectively held the keys of the kingdom with the president of the church, Joseph Smith. Clearly Joseph bestowed those keys upon Sidney and Frederick G. Williams when they were set apart as his councilors. There is zero indication that Sidney held these keys previously. The only sensible explanation is to propose that Sidney Rigdon is John the Beloved, and that he received the keys from Jesus Christ, Moses, and John the Baptist. The explanation that Sidney Rigdon is John the Beloved is not sensible at all. John the Baptist did not identify Christ as (Elias) Elijah. He identified Christ as one of the three fulfillments of the (Elias) Elijah prophecy. Elias will always mean Elijah, but due to the Jews limited understanding—and our own—Elias has become slang for a preparatory servant and for the Christ of all three watches. Jesus was Elias of the first watch; Joseph Smith was Elias of the second; and Sidney Rigdon will be the Elias of the third watch. This is an interesting theory. The problem is that nowhere in scripture, or anywhere else, are Joseph and Sidney identified as Elias. G.azelem is yet again pulling things out of thin air and declaring them as unquestionable facts without a shred of evidence to support them. Section 77 describes the angel ascending from hell as Elias in verse 9 and then refers to John the Beloved as Elias as well in verse 14. No, D&C 77:9 does not describe an angel ascending from hell. John saw an angel ascending from the east, as in the Middle East or Palestine. As I mentioned above, neither Joseph nor Sidney were ever dubbed as Elias. D&C 77:14 does appear to identify John the Beloved as Elias, but upon closer inspection, and upon weighing all of the available evidence, I have concluded that John is not Elias who will restore all things, but that the book he ate is a mission or ordinance for him in the last days, given to him by the angel (Elias who will restore all things). The little book eaten by John was an ordinance that tasted sweet as honey but was bitter in the belly. This is not referring to his role as the scapegoat in both the first and second watch, but as his role as Christ in the third watch. Christ drank from the bitter cup (3rdNephi 11:11) and when God goes forth as a mighty man (Isaiah 42:13) the man in which Christ indwells will retain the memory of the bitterness Christ suffered. The problem here, among other things, is that the idea of Christ indwelling in someone is a false doctrine. It’s also worth pointing out that Ezekiel had a similar experience, were he was giving a roll or scroll (book) to eat which initially was sweet as honey to him. But then once he is told the suffering he would have to endure to fulfill this mission, he went and did it in bitterness. So was he also Christ in a previous life then? That would be tough as Christ hadn’t been born yet, and certainly hadn’t drank of the bitter cup yet. Although many are prophesied to preach unto every nation, kindred, tongue, and people, Sidney Rigdon was given a direct commission unto the kings of the earth in Section 124:107 alongside the marred servant (and William Law who will be another great man of the last kingdom). G.azelem is forgetting two men. Robert B. Thompson and John C. Bennett were also called to help with this proclamation. If these guys will all be given a free pass for their sins, then I guess we’ll all be saved in the kingdom of heaven in the end, after perhaps being beaten by a few stripes. We might as well eat, drink, and be merry. I guess in G.azelem’s eyes Sidney’s patriarchal blessing can only mean that he will be the Christ of the third watch, but the problem is yet again, that there just isn’t any evidence to support this idea. It is possible that Joseph is the Rod of Jesse. Even though we don’t have any indication that Joseph was of Judah and Ephraim, this may very well be a mystery that will yet be revealed. My personal belief is that Joseph is the Rod of Jesse from Isaiah 11 and D&C 113, but I could be wrong. Jacob prophesied that all the tribes of Israel would bow down to the fruit of the loins of Joseph from generation to generation. (JST Genesis 48:10) The apostles knew that a second act needed to take place in which the keys of the kingdom were to be given unto Ephraim. G.azelem is correct that Ephraim will do the gathering. Ephraim will be the one to gather Israel as the 144,000 high priests. However Ephraim had to be gathered, or at least identified, first. This was the purpose of Joseph receiving the keys to the gathering of Israel and there reason those keys were passed to the church. This is why most LDS are identified as Ephraim. Ephraim was to be gathered first, through the keys of the gathering of Israel given to Joseph Smith and then the church. Then when the time is right, the righteous remnant of Ephraim will gather the rest of Israel home to Zion, the New Jerusalem. Joseph Smith, a descendant of Ephraim, received these keys, and this is why he holds the seal of the living God over the twelve tribes of Israel, because they are to bow down unto him. G.azelem is misunderstanding things yet again. The blessing pronounced upon Joseph had to do with his posterity not with him personally. The same goes for all of the blessings given to the sons of Jacob and Ephraim and Manasseh. Joseph Smith is Joseph of Egypt. Understanding Joseph to be the servant of the vineyard in Jacob 5 indicates that his ministry began long before the first watch, when the wild olive trees (Gentiles) were first grafted into the olive tree of Israel. Joseph Smith did this as Joseph of Egypt by marrying a Gentile woman. Joseph in Egypt did not marry a gentile woman and he is not Joseph Smith. G.azelem’s speculation is truly running wild here. He has shared many scriptures, but not a single one identifies Sidney Rigdon as John the Beloved, Elias-preparer, or Christ/Elias-restorer. Answer: JST Revelation 12:7 states that the man-child is the “kingdom of our God and His Christ.” Having said that, the man who is to be the king of the kingdom of God (Israel) is also implied. This is of course Elias who will restore all things or the Davidic Servant (both being the same person). Many people believe that Elias will be John the Beloved and that he is therefore the man-child, based on D&C 77:14. I use to believe that myself. I no longer think he is, but I could certainly be wrong. The interpretation of Satan being cast out of heaven during the Morley Farm conference just doesn’t work. Other scriptures clearly show that Satan was cast out of heaven long before that. Evil spirits who followed Satan were possessing people during New Testament times and the Savior even stated that He had beheld “Satan as lightening fall from heaven.” (Luke 10:18) How could they do this be if they were not already cast out of heaven and on the earth? 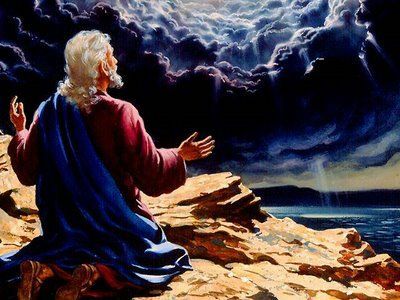 How could Satan appear unto Moses in Moses 1:12-22 if he was still up in heaven? Or how could he appear to Cain or even the Savior? The Lord actually told Moses how Satan had become Satan in Moses 4. We see a similar thing in Abraham 3. This is speaking of the council in heaven before the world was created. Satan became angry and many followed after him. Between Moses 1 and Abraham 3 we can see what happened. Therefore Revelation 12 is merely giving us the story one more time so it is clear that the dragon is Satan and that this war between Satan and the Saints of God has been going on since before the world was. We are told that Satan and his followers were cast to earth and did not receive bodies, as they did not keep their first estate. Here they have continued their war against the Saints of God. As for the Morley farm conference. The Melchizedek priesthood was restored before that. It was restored in 1829. There were already Elders before the church was organized. Elder is an office of the Melchizedek priesthood. The Joseph Smith quote about Morley farm doesn’t say what G.azelem thinks it does. What Joseph is saying is that Satan was detected by the authority of the Melchizedek priesthood and at this meeting several of the elders were ordained as High Priests, which was the first time this had happened in the church. There is absolutely nothing to suggest that Satan was in heaven and was cast down during the Morley farm conference. This is the timeline put together by Watcher, but the problem is that the Melchizedek priesthood was on earth and with the church in 1829, so the three and a half years would have ended in 1832 not 1834 as Watcher claims, and G.azelem echoes here. Even if we were to believe that the fulness of the gospel was rejected by the saints in 1834, how does one explain the spiritual outpouring at the Kirtland temple dedication? Clearly the fulness of the gospel and priesthood were still on earth at that time. Satan would not overcome the Saints until later. Joseph Smith Sr. and Hyrum Smith were both masons as well. Brigham Young received his endowment from Joseph and not the other way around. Brigham Young would administer the masonic endowment unto the church membership in the corrupted Nauvoo temple. The endowment was first administered by Joseph Smith in the red brick store. During this ceremony, Brigham would position himself in the role of God. This is not correct. Brigham Young played the role of God the Father in the endowment ceremony according to an expose from the Nauvoo era, but he did not position himself as God. Actually we don’t know what exactly Satan said in the Nauvoo era endowment. The line G.azelem is quoting is from the modern endowment, which has undergone many changes from the original. We actually don’t know what the exact wording of the original endowment was. It is also my understanding that it was once taught during the endowment that everything Satan says in the ritual is not to be trusted, as he is the father of all lies. Furthermore, breaking one’s covenants with God, will absolutely put one in Satan’s power, so I don’t see what G.azelem has a problem with here. There is also nothing in the endowment of which I am aware, which can in anyway be associated with secret combinations. The third watch bloggers like to take shots at the endowment, but I have yet to find a convincing argument from them as to why they believe the endowment is from Satan and a secret combination. Regardless as to how sinister or oblivious Brigham was, the fact remains: God had delivered his people over to Satan. If the Nauvoo endowment is supposed to be the evidence that God had turned the Saints over to Satan, I would expect an explanation as to what in particular was Satanic about the endowment and why God had Joseph Smith, and not Brigham Young, introduce this to the Saints. G.azelem doesn’t provide any explanation at all for his accusation. Without the sanctifying power of Christ’s authority, no one will be able to keep the commandments; and thus all who have entered into the covenants made in secret chambers are under the power of Satan. Ether 8 is talking about actual secret combinations to get gain and commit murder, which are hidden from the world. Ether 8 is not talking about the LDS endowment. G.azelem is correct that we need to wake up to our awful situation and repent. There is great wickedness in high places, which is kept hidden from the world. There are powers in secret places, who are in fact seeking to overthrow the liberty of all nations and bind us down into slavery. This is currently being accomplished by destroying what little is left of the U.S. Constitution and by pushing Satanic ideas down the throats of Americans and the world at large through feminism, the LGBTQ movement, gun control, politically correctness, and much more. Satan’s tactic today is sometimes referred to as Social Communism. Additionally, the church is in a state of apostasy and going along with these evils. Satan truly has the world veiled in darkness and grasps us with a chain. This is an awful situation indeed.